maximum image quality. 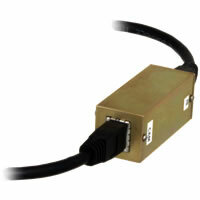 Extra shielding, to protect signals from EMI (Electro-Magnetic Interference), is added around the connections between the multi-conductor cable and the RJ-45 connector. Three categories, or classes, of cables are offered. 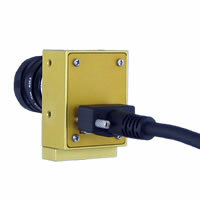 SI cables (CBL-SI-##FT) are recommended for applications with limited camera movement. These are the lowest cost cables. They offer excellent signal propagation, but are the stiffest; i.e. have the largest bending radius. Note in the Maximum Frequency Charts, that cable lengths of 7, 10, and 14 feet support maximum data transfer rates for all SILICON VIDEO® cameras. All SI cables have straight-in RJ-45 connectors on both ends. SI-S cables (CBL-SI-S-##FT) are recommended for applications that might require regular or frequent re-positioning of the camera. These are medium cost cables with greater flexibility and smaller bending radius than the SI cables. These cables allow easy camera movement. Notice, in the Maximum Frequency Charts (below), that cable lengths of 7, 10, and 14 feet support maximum data transfer rates for all SILICON VIDEO® cameras. Cable lengths of 25 feet and longer do not perform quite as well as SI cables. All SI-S cables have straight-in RJ-45 connectors on both ends. SI-SH cables (CBL-SI-SH-##M, CBL-SI-SH-RAT-##M, and CBL-SI-SH-RAC-##M) are ruggedized versions of the SI-S cables and are intended for applications that require frequent camera movement or for applications that might otherwise stress the camera’s RJ-45 connector. 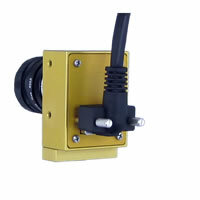 Examples include use of a SILICON VIDEO® camera at the end of a robot arm or in an industrial environment in which the camera and cable may be subject to excessive pull or torque. 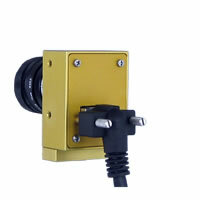 SI-SH cables have the same enhanced flexibility of SI-SH cables with the addition of a camera RJ-45 connector that is secured to the camera case with thumbscrews. Cable stresses are absorbed by the metal camera case while protecting the RJ-45 connector. 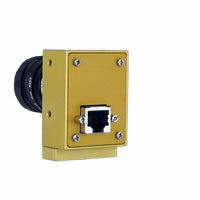 These cables are available with camera connectors that are either straight-in or right angle. The two right angle connectors direct the cable up or down as shown in the images to the right. Because of different camera designs, refer to the images to determine the appropriate cable routing for your particular camera and application. The board ends of all SI-SH cables have straight-in RJ-45 connectors. The Maximum Frequency Charts list the maximum pixel clock frequency available for a particular cable (listed in the Order Code column at the left) when used with a particular camera model (listed at the top of the chart). The pixel clock frequency determines the maximum amount of data that can be transferred from camera to frame grabber. Higher pixel clock frequencies can generate more data and allow higher resolutions, faster frame rates, or a combination of both. (Other factors, unrelated to cable selection, also affect the maximum frame rate). with Specific Cables (MHz) connected to a PIXCI SI1 or SI4 board. Note: Due to cable variations, expected accuracy is approximately +/- 3 MHz. with Specific Cables (MHz) connected to a PIXCI SI board.